In one of my blogs last week I mentioned how important it was for your indoor air quality to keep up with regular maintenance of your homes air filters. As cold as it has been in Minneapolis, well all of Minnesota, it is important to make sure we are doing other steps to keep our indoor air quality the healthiest it can be. There is a myriad of reasons your indoor air can be polluted. Some sources, such as building materials, furnishings, and electronics, can release pollutants more or less continuously. Other sources, like smoking, cleaning or renovating, can release pollutants intermittently. Unvented or malfunctioning appliances can release potentially dangerous levels of pollutants indoors (which is why it’s so important to have a working carbon monoxide detector in your home). And if you think spraying scented air freshener will clean your air, think again. That scent is a form of indoor air pollution, and most air fresheners just release more potentially harmful chemicals into your home. And the health issues caused by those chemicals cost about $340 billion a year in treatment and lost productivity expenses. Read on for some tips on improving your indoor air quality without the use of chemicals. Spruce up your décor with houseplants. Having indoor houseplants can help improve indoor air quality. For example, spider plants are effective at reducing benzene, formaldehyde, carbon monoxide and xylene. Here is a great article I found that lists the top 10 houseplants for cleaning your air. Opt for essential oil diffusers. Some essential oils, like tea tree oil, have antibacterial properties and can be added to homemade household cleaners or even applied topically to your skin to treat a small cut. But did you know these oils also reduce airborne bacteria? Essential oils like eucalyptus, tea tree, clove, and rosemary have been proven to help reduce the number of dust mites in your house too. My favorite in the winter is eucalyptus! *I keep a small spray bottle of eucalyptus in my shower, spraying 4-5 pumps while showering turns your shower into a eucalyptus steam room! Try it! Trust me, you will thank me! Opt for beeswax candles. Bare with me on this one, because it’ll get a little scientific (btw, I am kind of a science nerd!) The reason particles float in the air around us is because they are positively charged ions. The air is cleaner in the woods, or near a waterfall, for example, because nature creates negative ions, which bind to the positive ions, causing them to be heavier and fall to the ground. Burning pure beeswax candles artificially creates this phenomenon indoors, cleaning the indoor air. However, if you have read some of my other blogs, you know that burning any kind of candle still sends soot up into your air. To avoid that completely, consider LED candles, which will pollute the air less, and reduce the risk of a fire and the disaster of smoke or fire damage. Take your shoes off. Okay, for me this seems like an absolute no brainer! But it is alarming how many people walk in their homes with their shoes on!!! (Gross!) No offense if this is you, but here’s a simple fact to consider making a change! The dirt outside can carry some really yucky stuff: pesticides, pollen, fungi, bacteria or feces, for example. When you walk inside your house, any or all of that could be on the bottom of your shoes, so it’s best to take them off when you get inside. It’ll help keep your air cleaner — not to mention your floors. Keep your pets groomed. 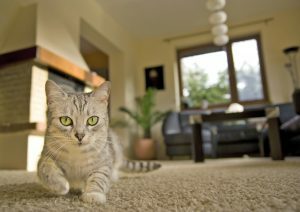 Pet dander — your pets’ skin cells — is found nearly everywhere in a home with pets. Even more than pet fur, dander can cause you to develop asthma-like symptoms or exacerbate your asthma if it already exists. If you have a pet, be sure to keep dander to a minimum by cleaning them regularly, brushing them outdoors if you can and vacuuming floors and furnishings regularly with a HEPA filter. Clean with nontoxic chemicals. Many store-bought household cleaners contain toxic chemicals that can cause eye, nose, throat and lung irritation. If you’re going to use these, at least open windows while you do. But as a greener option, consider making your own household cleaners using ingredients such as vinegar, baking soda, citrus juice or essential oils. Use an air purifier. Air purifiers can be an effective way to reduce harmful particles in the air. If your child has asthma, it may be worthwhile to have one in his room. Get rid of mold. This fungus releases spores into the air that can trigger allergy symptoms. It likes to grow in dark, damp places, such as your bathroom, laundry room, and basement. There are ways you can clean mild mold yourself, but for the safety of yourself and your family, if you see mold give 24Restore a call for an assessment. Many times if you have mold in your home you have an underlying issue that will keep it from going away forever. Our highly trained team can evaluate the causes and give you solutions. Air out new furniture. Volatile organic compounds (VOCs) are chemicals that linger in the air, and they are everywhere in our homes. VOCs such as toluene and benzene are found in things like glues, paints, fabrics, construction materials and more. When you buy a new sofa or armchair, know this: It will emit VOCs, more heavily at first and then taper off. To reduce the harm to your indoor air, air out as much as possible to allow VOCs to escape. If you can, keep it in your garage for a week. Use cooking oils with higher smoke points. To avoid a kitchen filled with smoke and a lingering smell of burnt oil wafting through your house for hours, use cooking oil that smokes at higher temperatures. Extra virgin olive oil has a lower smoke point compared to avocado, peanut, safflower, canola, corn and sunflower oil. If you prefer the taste of olive oil, you can use light olive oil, which has been refined and has a smoke point of 486 degrees Fahrenheit compared to 410 degrees for extra virgin olive oil. Stay warm again this weekend Minneapolis! … and stay positive, this cold snap is not going to last forever!! !